The Quantico Tri features a start near Officer Candidates School (OCS) with a 750 meter open water swim in the Potomac River. Athletes transition to a nearly 20K cycle tour of the Marine Corps Base. The Quantico Tri concludes with a 5K run, the distance every Marine must complete annually as part of the Marine Corps physical fitness test. 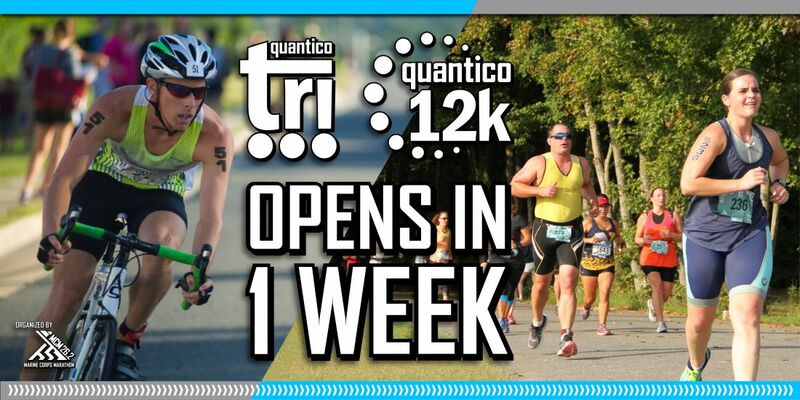 The Quantico 12K is a 7.46 mile run-only option on the same day as the Quantico Tri. The 12K finishes alongside the famed OCS PT field. Preparation begins here for Marines, as well as many runners training for the MCM. New this year, the Quantico Mile affords runners of all ages to #RunWithTheMarines. Starting just before the 12K, the mile course shares the finish with the other events and is stroller friendly. All participants receive a custom designed T-shirt. Quantico Tri and 12K finishers earn a medal. Registration for the Tri is $78. The 12K is $47. The Mile registration fee is $10 for ages 5-12 and $23 for participants age 13 and above. All three events are qualifiers for the Distinguished Participant medal, earned by finishing an event during Historic Half Weekend in May; either Run Amuck, Recon Ruck, Belleau Wood 8K or Crossroads Challenge in June; an August event; and Turkey Trot in November. Check out these images from 2018 and picture yourself as a part of the action.